Madina and I first met for coffee downtown and I instantly felt great vibes from her. She shared her vision for her new fashion instagram account and aspirations for a new business. From that first day, I wish I had my camera with me to capture her killer outfit! Since then, we've been working together consistently to create a specific feel and look for her instagram. She always comes to shoots prepared to the 9s with unique outfits, every accessory picked out, and a stunning range of hats that leave me droooooooling. 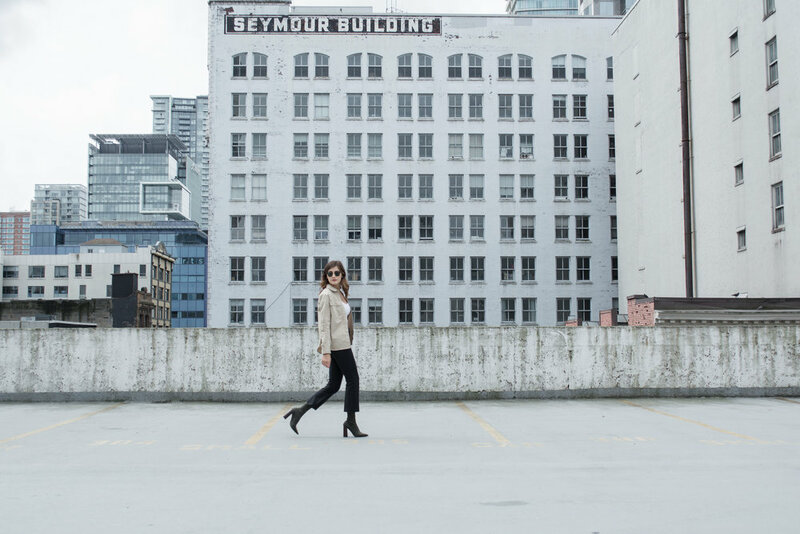 Our first shoot had a strong urban flare - focussing on fashionable streetwear clothing that any Vancouverite can sport in the fall or early spring. Luckily, downtown is infamous for having such variety in backgrounds, all within walking distance! With spring in full swing, Madina took me to this dope overpass that I've seen around in other photographs and showed how one outfit can transition to two different looks so easily! Madina and I have a lot coming down the pipes for y'all and I'm so excited to continue to work with someone so sweet and who inspires my fashion game. Maybe next time I can convince her to help me go shopping! Madina's Instagram is full of killaaaaa outfits! Follow her now!